Winning entry from Willowbrook Nurseries for the category, Design on a Skid. 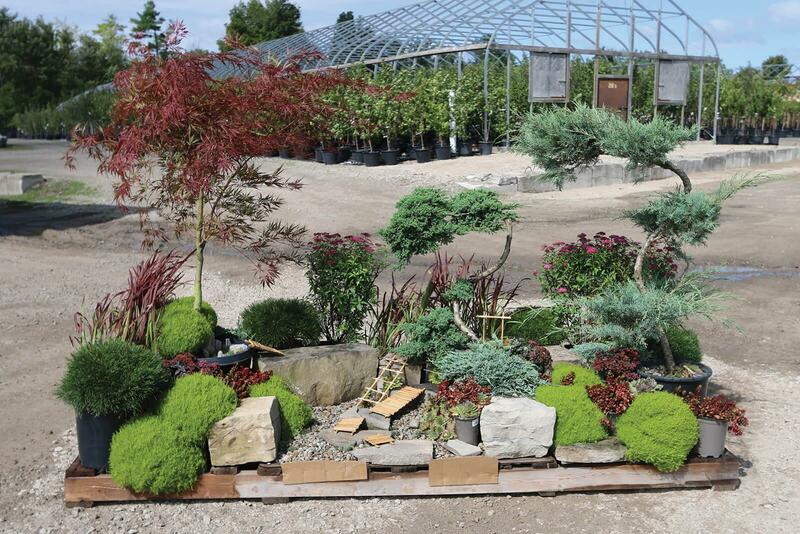 Growers of some of the finest nursery stock in Ontario were recognized with Landscape Ontario Growers Award of Excellence on Sept. 13. Held in conjunction with the growers Industry Auction at NVK Nursery in Dundas, Ont., the awards program sees members from Landscape Ontario’s grower sector enter skids of plant material in one of 11 specific categories. Delivered to the auction location, all plant material entered is judged live, on-site the morning of the auction by a small group of well-respected judges whose very careers involve dealing with all types of plant material on a daily basis. Thanks to this year’s judging panel of: Jennifer Llewellyn, OMAFRA; Perry Grobe, Grobe Nursery and Garden Centre; Sean Fox, University of Guelph; Jon Peter, RBG; Jim Lounsbery, Vineland Nurseries; Glen Lumis, University of Guelph. Judges examined all entries in the morning and winners of each category were announced and put up for bid to kick off the live auction at 1:00 p.m. Warren Patterson, president of Landscape Ontario, was on-hand to present award winners with a certificate of their achievement. Sheridan Nurseries Category 2: Evergreens - Container Grown, Upright and Spreading, for Assorted evergreens. Canadale Nurseries Category 3: Broadleaf Evergreens, for Assorted broadleaf evergreens. Sheridan Nurseries Category 4: Deciduous Shrubs, for Assorted deciduous shrubs. Willowbrook Nurseries Category 6: Deciduous Ornamental Trees, Top Grafted/Worked, for Hydrangea paniculata ‘Limelight’. Ground Covers Unlimited Category 8: Vines and Groundcovers, for Cornus Canadensis. Millgrove Perennials Category 9: Perennials, for Assorted perennials. Winkelmolen Nursery Category 10: Unusual and Rare Plants, for Ginkgo mariken. Willowbrook Nurseries Category 11: Design on a Skid, for Assorted plant material. Millgrove Perennials Judges Choice, for Assorted perennials (Category 9). Plaques will be presented to winners at the Growers Fall Dinner Meeting scheduled for Nov. 27. In addition to the growers program, Landscape Ontario holds annual awards competitions for the garden centre sector, and the construction, maintenance and design sectors. Winners for those programs will be announced during special ceremonies in conjunction with Congress ’19, January 8-10, 2019 at the Toronto Congress Centre.